Photo by Greg Clark | Reusable water bottles were given barcodes for students to scan and earn discounts at the school store. Last April, a new program was launched on campus that encourages students to refill reusable water bottles and scan each refill with the Fill it Forward mobile app. Each refill helps students earn points, and 1,000 scans of a Fill it Forward water bottle sticker can earn 10 percent off at the school store. Cupanion, the company in charge of the Fill it Forward movement, donates a cup of clean water to someone in need each time a tag gets scanned. Tags have been handed out at sustainability events, Welcome Day, Orientation and more since it’s soft launch last spring. You can apply a tag to your reusable water bottle and scan it each time you finish it. On the Fill it Forward app, you can track your footprint, daily water count and scanning streak. You can add reminders to drink water, scan, as well as see what countries are benefiting from your scans. 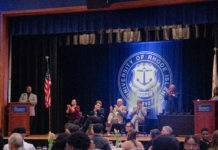 Campus Sustainability Officer Marsha Garcia collaborated with the University of Rhode Island Campus Store to make this project possible. In addition to handing out water bottles and stickers at events last semester and over the summer, Garcia gave many first-year students reusable water bottles with tags on move-in day. Garcia worked with the Coca-Cola, one of URI’s partners, to provide students with these branded water bottles. Garcia said that Cupanion reached out to her in the Office of Sustainability and pitched the Fill it Forward app, emphasizing it’s on-campus waste reduction and mission statement. Every scan gets you 10 points, so after 100 scans, you can get 10 percent off clothing and gift items in the Campus Store. Since the soft launch in April, Garcia has seen 344 downloads of the app, 559 average reuses per month, 18 average reuses per day, 3993 total reuses, 3,993 total disposables diverted from the landfill and saved $600 worth of plastic bottles on-campus. The scans are only applied when on the URI campus, however. “It knows the quadrants of the whole campus so you’re not supposed to be able to scan from home because we’re really trying to tell the story of how much we’re reducing on campus,” Galuska said. Sara LiVecchi, a senior writing and rhetoric and communications studies double major is currently the sole communications intern with the Office of Sustainability. Her job is to promote and advertise events and campaigns such as Fill it Forward. LiVecchi hopes to see more water filling stations inserted into the non-freshmen housing in the coming semesters. 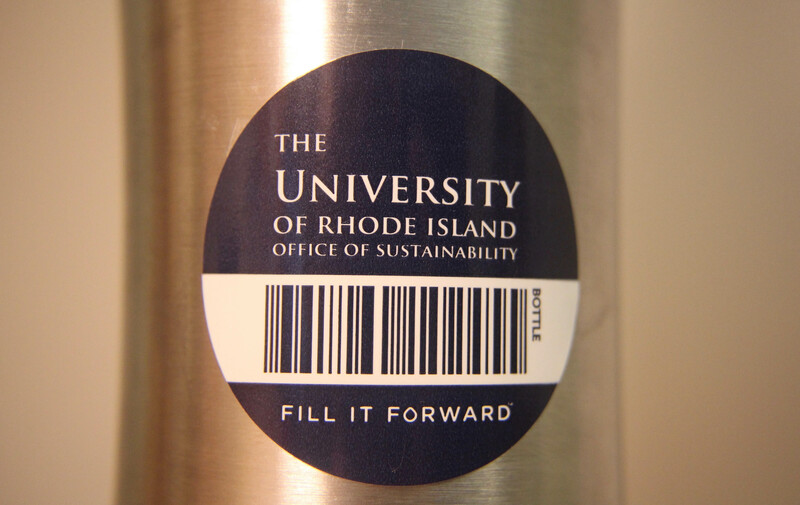 The Office of Sustainability is working to distribute more Fill it Forward stickers at their events in the future and throughout #NoWasteNovember. Next articleHow food insecure is URI?